Many times as artists we are asked to participate in student events...curating an exhibit, giving a workshop, making space for an internship. But for the first time, I have been asked to participate in a SENIOR event. In June, a local senior living facility is having an arts festival and I have been asked to exhibit alongside the residents. As I chatted with the activities director, she explained the challenges that seniors face as they create. From diminishing eyesight to more serious physical disabilities, these seniors continue to push themselves and express themselves through art. I am honored to have been asked to participate in their festival. 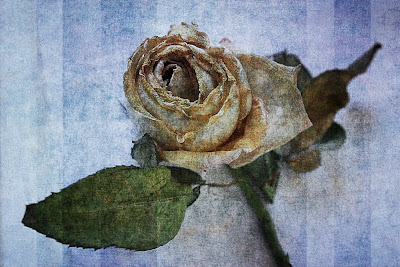 In response to what I have learned about them, I am working on a new series, in which I have photographed roses which are past their prime, but in whom beauty can still be found -- unique textures, hidden bursts of color, a joy and a reflectiveness -- all of which remind me of these seniors. Stay tuned...I will post again during or shortly after the exhibit so you can see their fantastic work.